Christmas Day! Make a joyful noise to the world. Please click here to watch on YouTube. Shown to the left are Past District Governors Hal Griffin and Earl Pollock. 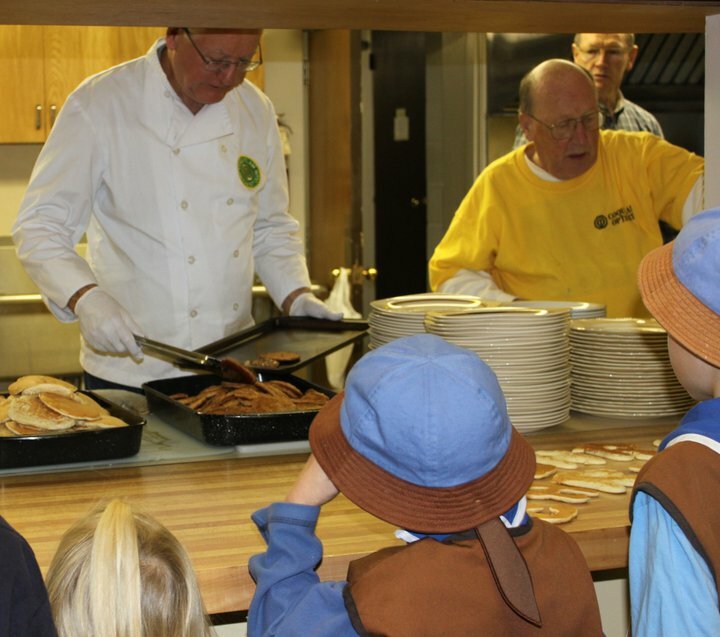 The Gresham Optimist Club held their first Shop with a Cop for 2010 on Saturday, December 11. Coordinated by Optimist Club members Sharon Strickland and Joe Anderson, fifteen youngsters were treated to a day of shopping at Target. Each child was paired with an Optimist Club member or police officer to help them pick out gifts for themselves or their families. After the shopping trip, everyone enjoyed lunch at Burgerville thanks to Burgerville manager Kevin Schmid. The next Gresham Optimist Club Shop with a Cop will take place on Saturday, December 18, 9:30 a.m. at Fred Meyer in Gresham. 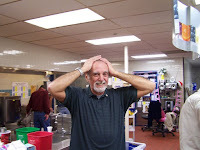 Thanks to Jean Jensen, Editor, Gresham Optigraph for the story and pictures. 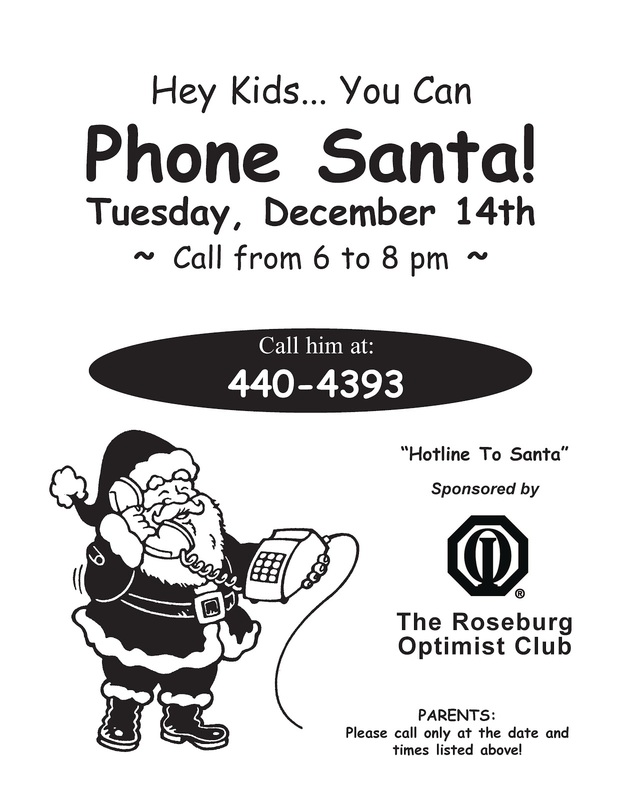 The Twin Falls Optimist Club Coats for Kids project has seen a boost this year with some good press relations both in print and on television, not to mention the severe dip in temperature that occurred over the past two weeks. Here's a quick look at the project from KMVT News - Twin Falls. Want to know even more about how this fantastic project works? Click here to see an article from the Magic Valley Times highlighting the experiences Perrine Elementary School Principal Bill Brulotte and Babbel's Cleaners, an important player in the project. Contact information for Committee Chair Patsy Bland is included. It's a Wii Charter Party! 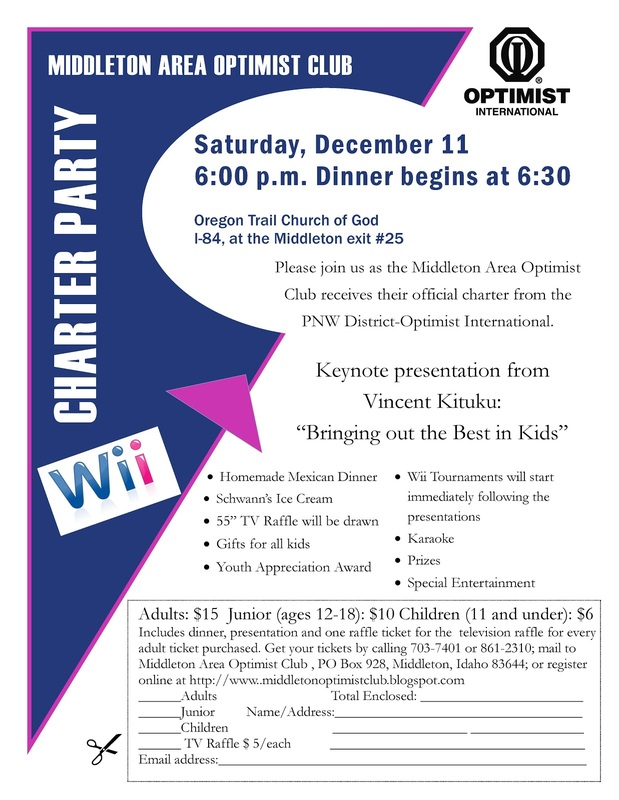 The Middleton Area Optimist Club is celebrating their affiliation with Optimist International and the Pacific Northwest District with a Wii Charter Party. Everyone is invited to attend for dinner, a motivational presentation form international speaker Vincent Kituku and lots of fun with karaoke and a Wii Tournament. Please make your plans to attend today. Saturday, December 11, 2010, 6:00 p.m. Please click on the flyer for complete details. You can register online at www.middletonoptimistclub.blogspot.com. One week ago, the Optimist Club of Albany, Oregon coordinated one of their major community outreach efforts: The Veterans Day Pancake Breakfast. Today there were pictures posted on Facebook commemorating the event. I pulled out a couple that made me smile. Thank you Albany Optimists for your service and especially for recognizing our veterans. 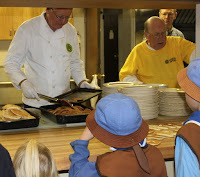 Click here to be a friend of the Albany Optimist Club on Facebook and see more photos. 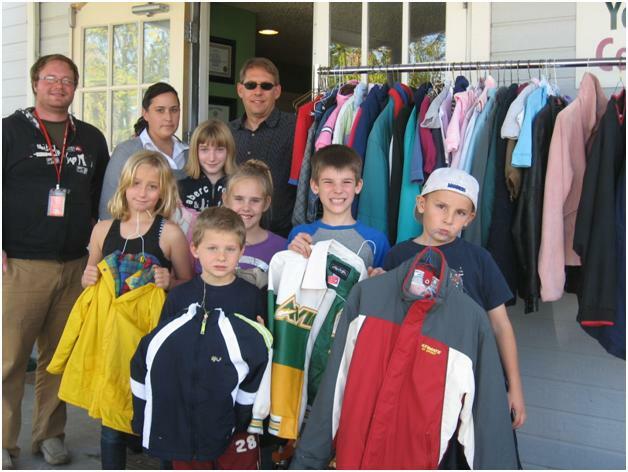 The Optimist Club of Eagle, Idaho completed its annual Coats for Kids drive by donating over 150 coats to the Landing Community Center. The drive was coordinated by Eagle Optimist Club member Brian Doerty. Coats were collected from donation barrels located at businesses and schools around Eagle and will be used to keep local children warm during the cold winter days ahead. Children or their parents may stop by the Landing at 175 E. Mission Street to choose a coat. There are also a number of hoodies and sweatshirts that are available. All are being provided at no charge. Along with the children, in the picture are Clint Koefoed with the Landing Community Center; Lindsey Pretty Weasel, Washington Trust Bank; and Mark Sjobeck, Custom Care Cleaners. Custom Care Cleaners donated cleaning for all apparel. 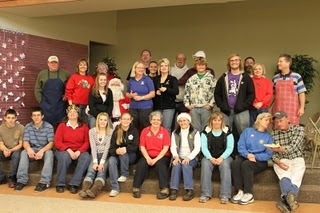 All are members of the Eagle Optimist Club. Governor Ed Murphy says, "We need Optimist Clubs in Seattle!" The Seattle-Tacoma-Bellevue metropolitan statistical area is home to 3.3 million people and 3 Optimist Clubs. With that kind of data, Optimist International has offered to help generate excitement for new club building in the Seattle area. The plan: Optimist International President Danny Rodgers, Optimist International President-elect Jack Creswell, and international committee members Essie Johnson, Mark Weinsoff, Jim Oliver and Sue Creswell will present a week-long new club building seminar on January 17-21, immediately before the Second Quarter District Meeting on January 21-22 in the Seattle area. 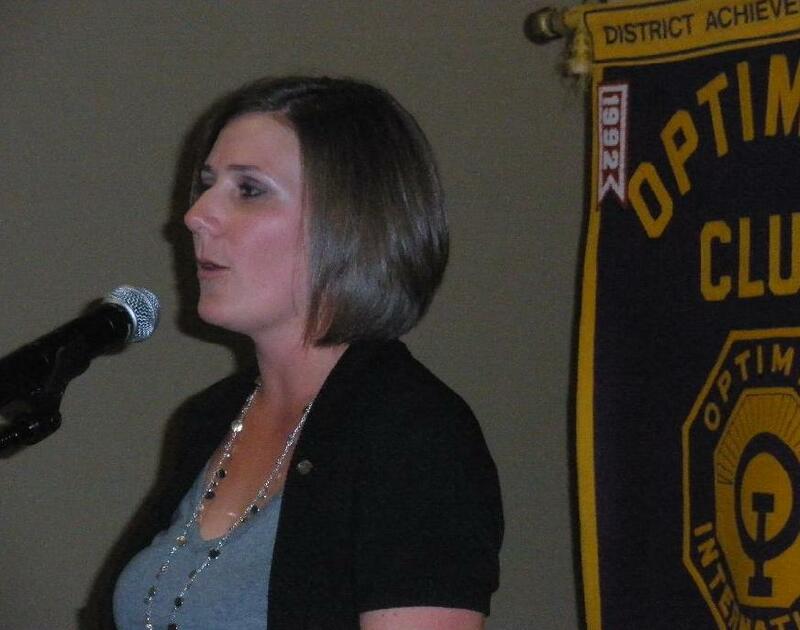 During this time six communities will be targeted for new Optimist Club growth. The core piece of training is walking and talking in neighborhoods and businesses to invite people to an informational meeting in the evening where they will learn more about the potential for community service that an Optimist Club offers. At least six people are needed to commit to follow up with the potential new growth communities for six weeks following this conference and then on a quarterly basis for one year once a new club is started. Forty-three years ago the Optimist Club of Beaverton, Oregon was chartered and Vern Williams was there. 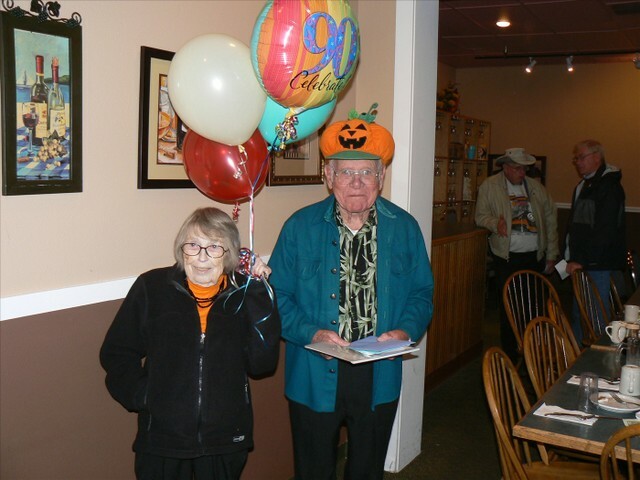 His legacy as a charter member was honored today by his fellow club members as they came together during a regular club meeting to celebrate his 90th birthday. 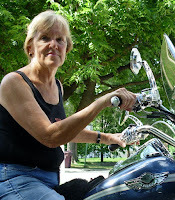 Writing about the event on Facebook, fellow club member Susan Nordstrom said, "So many turned out to talk so highly about him, he and his beautiful wife Pat had a great time this morning! Just so great to be surrounded by such a great "extended" family of such incredible people!" Yes, indeed. That is what optimism is all about: sharing our joys and dreams. Happy Birthday Vern from friends in the Pacific Northwest District. Slideshow provided by Beaverton Optimist Club President Alan Zehntbauer. Thanks Alan! Will you be joining us in Poulsbo on Friday? I hope so! Are you looking for new, younger members to help make your club projects more successful? While we as Optimists have been inviting people to join our clubs and participate in our meetings (Just Ask), companies like Nike have been appealing to the younger generation to become active and involved in things that make a difference (Just Do It!) This workshop takes a look at generational differences and how revisiting our attitudes and strategies may provide us with ways to revitalize, strengthen and energize our organization. It's not too late to register. Just do it! 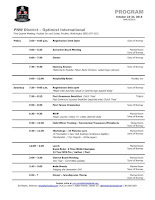 Plan to attend the Optimist International Convention...yes already! I was a little surprised to hear Christmas music as I was shopping at the mall last week, but I guess I shouldn't have been. After all, Optimist Clubs that sell Christmas trees have had trees on order for months. So I guess I shouldn't be surprised that Optimist International is already heavily promoting how every Optimist Club member should celebrate the 4th of July in 2011 - with fireworks and friends at the Optimist International Convention! The Optimist International Convention will be held in Baltimore Maryland, July 3-5, 2011. It's a great time to meet with people who think a lot like you, find out about the great things that are done around the world by other Optimist Clubs and learn how to develop and share your leadership skills with others. Find out all about the location, activities registration and travel at http://www.optimist.org/e/Member/convention1.cfm. Make your vacation plans today. 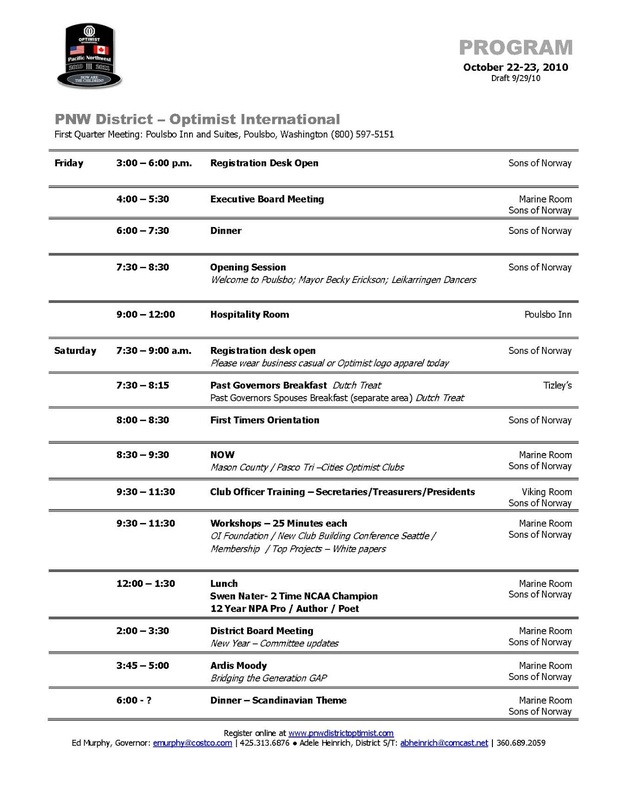 Let's show the PNW District Optimist spirit in Baltimore. Contact International Convention Ambassador Carol Murphy to find out more. It's hard to believe that the First Quarter District meeting is less than three weeks away! That's right, we get to come together very soon - October 22-23 - to kick off another new year of optimism. 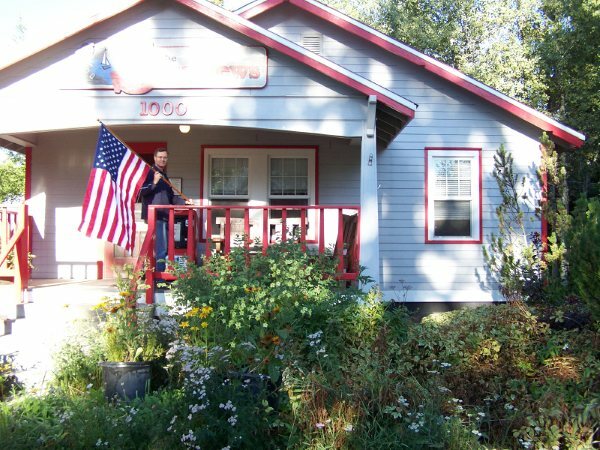 The first quarter meeting of the 2010-2011 administrative year will be held in Poulsbo, Washington at the Sons of Norway. Your registration includes all workshops, dinner on Friday, lunch and dinner on Saturday. The Poulsbo Inn and Suites offer a complimentary breakfast. Governor Ed has arranged for a special luncheon address from Swen Nater, former professional basketball player, coach, author, poet and motivational speaker. Coach Swen will talk to the group at lunch and share his "Lessons Learned from John Wooden." Known as the coach's coach, he specializes in youth sports. Find out more about Coach Swen at this link. Don't miss out on this exciting weekend of Optimist learning. If you have not yet registered, please click on this link to do so now. 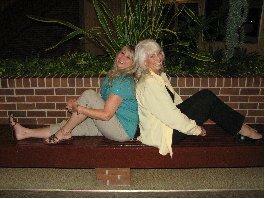 Dyan Graybeal and Sue Oliver will serve as co-presidents for the Boise Noon Optimist Club for 2010-2011. Bulletin editor Walt Callahan caught them taking a quick break before the beginning of the year. The Coquitlam Optimist Club recently held the Robert Simms Memorial Annual Scholarship dinner and presented ten graduates with scholarship awards. 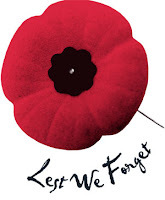 Please click here to find out more on the Coquitlam Optimist Club blog. The Twin Falls Optimist Club held their installation of officers on Saturday, September 25. The usual cast of characters were there - members, incoming officers and board members, committee chairs, retiring officers, board members and committee chairs - and Zorro. When I asked Bulletin Editor Donna Bohrn for an explanation she said, "Zorro always has a tradition of dressing up in costumes for our banquets. All the club looks forward to his yearly costume." 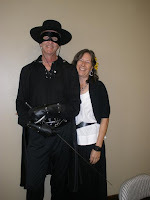 Zorro, a.k.a Dennis Bowyer, was on the dais this year as he was installed as club secretary/treasurer. Joining him as club president is the enthusiastic Kayleigh Godfrey. Her promise: We will have a club that is full of energy and excited members. And as always, Kayleigh, we know that you will have a lot of fun in the traditional Twin Falls fashion. Or at least your secretary/treasurer will. Congratulations! 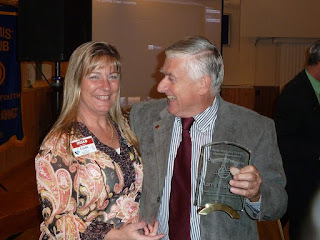 Don Weston, President, Gresham Optimist Club of Oregon named Teresa and Fred Wallace as co-recipients of the Optimist of the Year Award. He recognized the fundraising and project ideas, along with their optimistic attitude as the reason for choosing them for this honor. Teresa and Fred are new to the Gresham Optimist Club after many years volunteering with the Optimist Club of Lloyd Center. Congratulations! Has your club named an Optimist of the Year? Please send us their picture so we can add it to the blog. Complete and turn in your Community Projects Awards (CPA) book – This is a great opportunity to share your favorite project with other clubs so they can follow your steps to success. 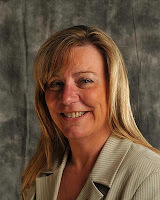 District Membership and Activities Chair Lorraine Coots has provided an excellent outline to help you get started. Click here. Submit your President’s Pride report online – This report lets you brag about all the great things your club has done. It’s a summary/Annual Report that you might want to share with your club members and the businesses and individuals who have helped your Optimist Club throughout the year. Add those last few members to help you do even more in the coming year – It’s more fun to belong to an Optimist Club when we have friends and family serving with us. Add at least one more Optimist Volunteer to your club’s roster before this administrative year comes to a close. 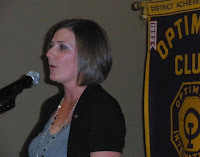 It is such an honor to be able to serve in a leadership capacity for our Optimist Clubs. I hope that your year has been all that you hoped for. As governor, I have had the great opportunity to learn more about the exciting projects that our clubs do and share your passion for service. I’ve enjoyed writing about them on the District blog and hope that you have enjoyed the new informative format at www.pnwdistrictoptimist.com. We will continue to expand this site in the coming year and I would love your help to write even more articles about Optimist Clubs in the Pacific Northwest. Over the past twelve months our district has grown and that is such a marvelous thing. As of this writing, there are approximately 100 more Optimist Club members volunteering in our communities than there were at this time in 2009. Thanks so much to every club who has cared enough to retain and replace your members. Without members, we can’t do the projects that we hold so dear. We have also added two new clubs to our family. 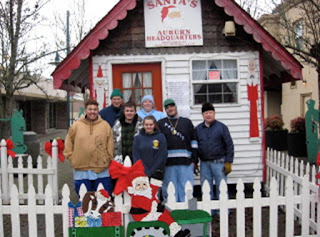 The Middleton Area Optimist Club and Eagle Optimist Club are proudly serving in Idaho. And I am cautiously optimistic that new clubs will be serving in Olympia, Washington and Hillsboro, Oregon very soon. As we head into the season of installation banquets and transition to new leaders, please do so with the upbeat, positive attitude that sets Optimist Clubs apart from all other organizations. Helen Keller said, “Optimism is the faith that leads to achievement. Nothing can be done without hope and confidence.” I know from personal observation, Optimist Club members live by that example. Thank you for all that you have done this year. 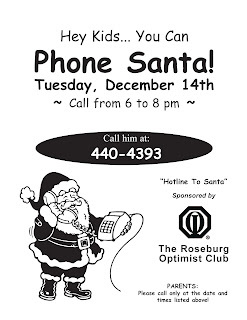 Thank you for making your Optimist Club one of your favorite things. They were soccer players on the Burnaby Optimist Club soccer team way back in 1995. Now they have been memorialized in the Burnaby Sports Hall of Fame. 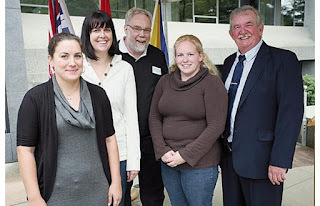 Congratulations to the team represented here by Yvonne Nichols, Kim Gray, Al McKay and Bre-Anne Graham with Mayor Derek Corrigan as their accomplishments were further recognized by the city with a carved paving stone placed at City Hall. Isn't it fun to find out a little bit of Optimist history? Picture courtesy of Burnaby Now. 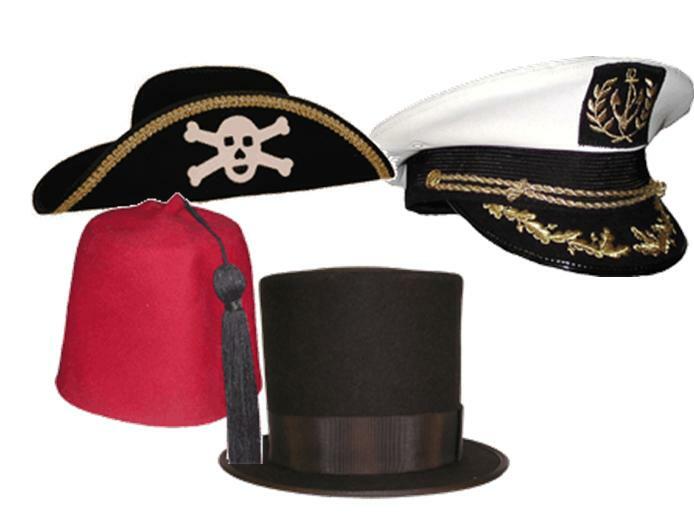 What hat will you be wearing in Poulsbo? The new administrative year is fast approaching! This is the time of year that a lot of us wear more than one hat as we get ready to pass the gavel to the next club or district leader or hand over the materials from our favorite project so the next committee chairman can take their place. It's also the time of year that we register for the 1st Quarter District Meeting. 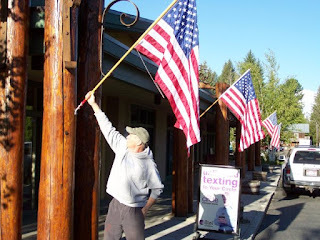 This year it will be held in Poulsbo, Washington on October 22-23. Click here to register online, make hotel reservations and find out more. Come one, come all. 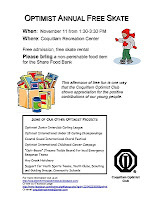 Join us in Poulsbo. See you there! Now is the time to submit your President's Pride report, complete and turn in your Club's CPA book, take care of any outstanding financial obligations your club may have, and add that last member that will help your club earn the quiet recognition it deserves. Every Optimist Club member deserves to be part of an Honor Club. Here's a very important update from Lorraine Coots, PNW District Membership and Member Retention/Activities Chair. Ensure your club receives Honor Club status! Submit your CPA entry to me, Lorraine Coots, this year’s CPA Chair no later than September 30, 2010. Send entries to PO Box 925, Shelton, WA 98584. Questions? Click here to contact me. The CPA Program is an annual competition that recognizes clubs for their community service, youth and fund-raising activities and is a requirement of the Honor Club Award. When you submit a CPA story, it provides your club and the clubs in our district a reference book that can be used in the future as a guide for the organization of a similar activity. It also gives our district the opportunity to recognize clubs for outstanding projects. Why wouldn’t you submit a CPA story? It’s one of our F A V O R I T E THINGS! Choose one of two categories: Community Service or Fundraising. Descriptions of the categories are listed in the rules. Uniqueness and creativity count for 50% of the total score, your step-by-step explanation of the project (so other clubs can run a similar project) account for 45% of the total score. Compliance with official rules make up the final 5%. Place your entry in a plain 3-ring binder or the official CPA binder, either is fine. Check out successful entries on the website listed above. Have fun putting your entry together. 2007-2008 winning entries can be found at: http://www.optimist.org/Documents/CPA-Winners-2007-2008.pdf. Our district will select two winning entries to submit to International -- one for Club Service and one for Fundraising Project. All the entries will be available for view at our First Quarter Meeting in Poulsbo October 22 and 23rd. See you there! I recently had a lot of fun visiting the West Tacoma Optimist Club and meeting another great group of Optimist Club members. 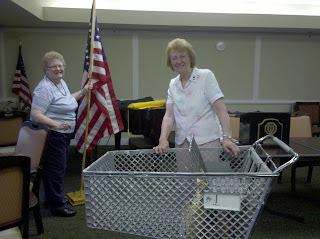 The club is being guided by President Shirley Zurfluh (right) this year and are they busy! In fact they just completed Tri-Star Basketball in the local schools with 569 participants. Davena Thompson (left) is the club treasurer this year and she has a tasty way of fundraising. Every once and awhile she bakes a pie and auctions it at the club meeting. This weeks delicacy was a cherry and mixed berry pie that sold for $52. Let me tell you it was great fun, even though I didn't win the pie. 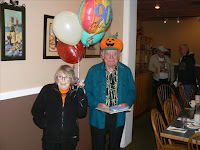 One of the signature activities of the West Tacoma Optimist Club is their celebration of Happy Dollars. Members share stories about their families in a way that truly helps them bond. While it was entertaining and enlightening to learn more about the West Tacoma Optimist Club, one of the most exciting part of the evening was watching the officers prepare for the meeting. First, the room had to be just the right size for the number of members and guests expected that evening and they had to have the right amenities for the presentation. 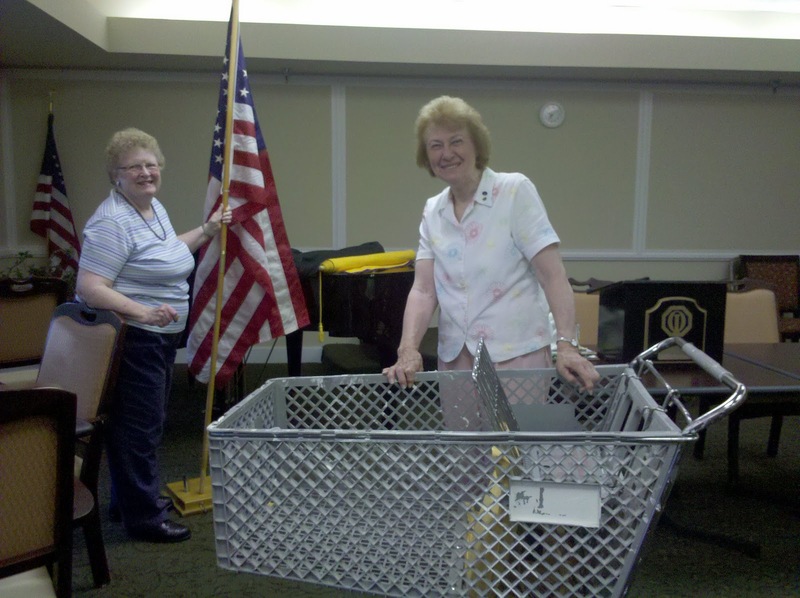 Next, the club officers wheeled out a shopping cart full of Optimist Club supplies. There was the US flag, Canadian flag, club banner, creed banner, lectern, bell and gavel and most treasured of all, the original framed copy of the club charter from 1956. Tradition and respect are key for this group of Optimists. Thank you for sharing your history and your optimism with the community and each other every day. Don Bohrn, President, Twin Falls Optimist Club, recently awarded Optimist of the Quarter awards to two deserving members. Thanks to bulletin editor Donna Bohrn, we are able to say kudos to Kayleigh Godfrey and Danae Klimes. Together they chaired the very successful administrative professionals day project and have brought energy and enthusiasm to the Twin Falls Optimist Club. It's a busy time around the Pacific Northwest District. New members are being added. New clubs are being started. New officers are planning installation banquets. Plus school is back in session so our Optimist Clubs are busy making plans and carrying out their fall programs. Yesterday I had the great pleasure of speaking to the Middleton Chamber of Commerce about the new Middleton Area Optimist Club and how service clubs and chambers of commerce can work together to enhance the quality of life in a community. Then I sped off to Jerome to visit with the Jerome Optimist Club where they are diligently working to complete the steps for Distinguished recognition this year. I know you can do it! Over in Olympia, Washington, the Mason County Optimist Club held their first informational meeting for a new Optimist Club. You go, girls! We want to see Mason County and club president Ellen Julian earn that Distinguished recognition as well. What's happening in your community? We would love to highlight your activities on our blog. Please send us a story today. Thanks! Here is a note from Harry White, Lt. Governor for Zone 1 and the District Chair for the Canadian Qualifier to the Optimist International Junior Golf Championships. Vancouver, B.C. 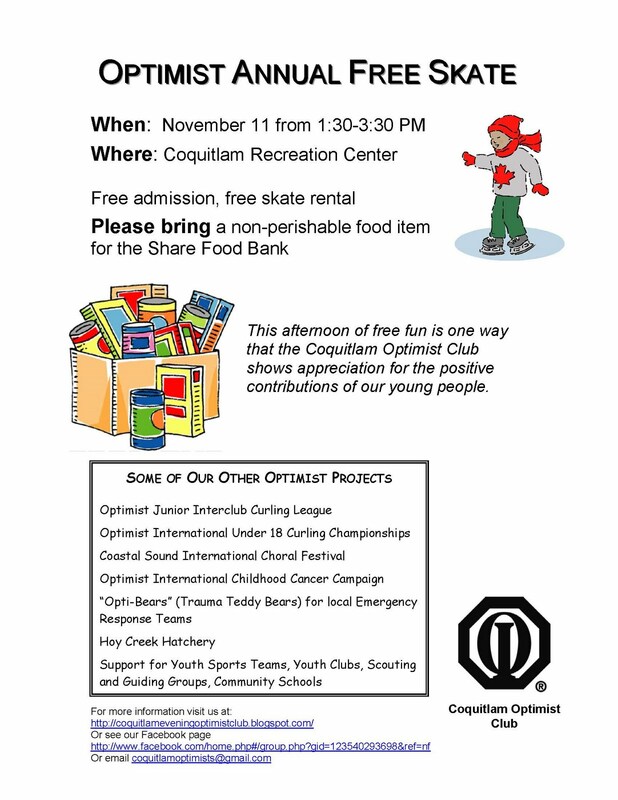 Optimists conduct a very extensive golf program for youth of Age 5 to 18, boys and girls. Over 70 events are held yearly in the Greater Lower Mainland, Fraser Valley, Okanagan and Vancouver Island (www.jrlinkster.com). Young and beginning golfers learn the Rules of Golf, Natural Golf technique as practised by the World's Best Ball-Striker, Moe Norman of Kitchener, Ontario. We are also affiliated with the Canadian Optimist Junior Golf Championships held in Ingersoll, Ontario (www.cojg.com) and the Canadian Junior Golf Association (www.cjga.com) And, of course we qualify and send players to the Optimist International Junior Golf Championships (www.optimist.org/golf) in Florida. Thanks for checking in Harry! We would love to hear a story from your club or zone. Click here to tell us one today. 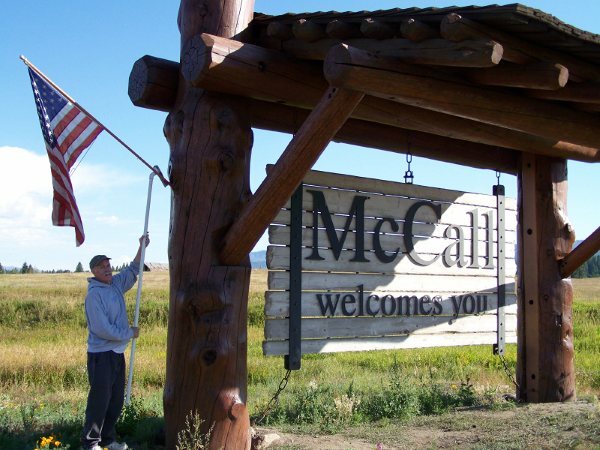 Our favorite flag crew was out early today getting ready for the Labor Day weekend. The McCall Optimist Club decorates the community for every national holiday and makes a little money in the process. Local businesses are happy to support the Optimist Club and show their patriotism by displaying Old Glory. Thanks to Jim Thackeray for the photos. Do you live in Olympia and want to join the best service club in the nation? Do you have friends in Olympia you would like to invite to join the best service club in the nation? I hope so! 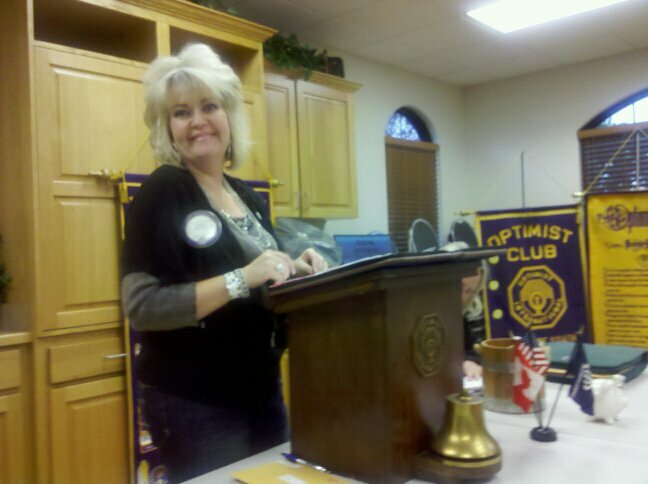 The Mason County Optimists are building a new Optimist Club in the Olympia area. Now is your chance to be part of this group and enrich the lives of children and youth in your community. Optimists Bring Out the Best in Kids! Yesterday at 4:00 p.m. twenty individuals joined together to become the Middleton Area Optimist Club of Idaho. We're so excited to introduce you to President Patrick Halpin and Secretary/Treasurer Estela Cabrera. 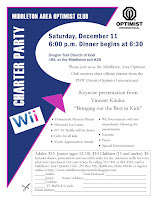 Please click here to read a little bit more about the new Optimist Club and the charter members. Guess what? They have already added two more members today! Congratulations and thank you to Larry Blackburn, Caldwell Optimist Club President and sponsor, Rocky Jackson, District Director of Growth, Anita Welchel, Connie Goins, Gene Brasse, Flo Blackburn and others from the Caldwell Optimist Club who helped along the way. 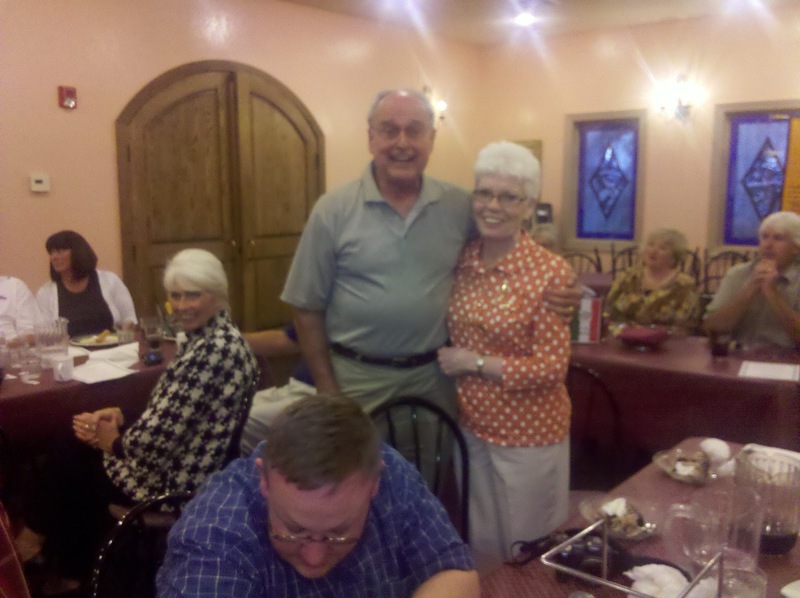 The Boise Noon Optimist Club hosts an evening social on the fifth Tuesday of the month. Last evening was a fifth Tuesday and I was happy to join them at the Boise Noon Optimist Club Youth Sports Complex along with about 35 other Optimist Club members from the Boise Noon and Meridian clubs. Along with catching up with stories between clubs, Jerron Moore, Executive Director of the football program announced that the Boise Noon Optimist Club had just been informed they would receive a $293,000 grant from the City of Boise for further improvements to the park. He described the projects that included a playground, tennis court, restroom facilities and more grounds and field expansions. Congratulations! The Boise Noon Optimist Club program is the largest youth football program in the United States run completely by volunteers. 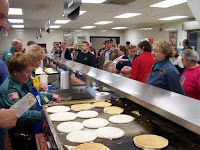 Volunteer members conceived, developed and maintain the facility, raise funds for the complex, manage the concession stands, oversee and sometimes conduct construction projects, and coach the children, both boys and girls in football and cheer. One other thing that you can add to their to-do list is striping the fields. Club bulletin editor Walt Callahan shared the following pictures with us of the striping crew at work. The Boise Noon Optimist Club football program and youth sports complex - it really is a labor of love. 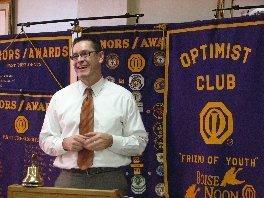 Thanks to Walt Callahan, Bulletin Editor Extraordinaire of the Boise Noon Optimist Club for the pictures. We were honored to have two representatives from Optimist International. 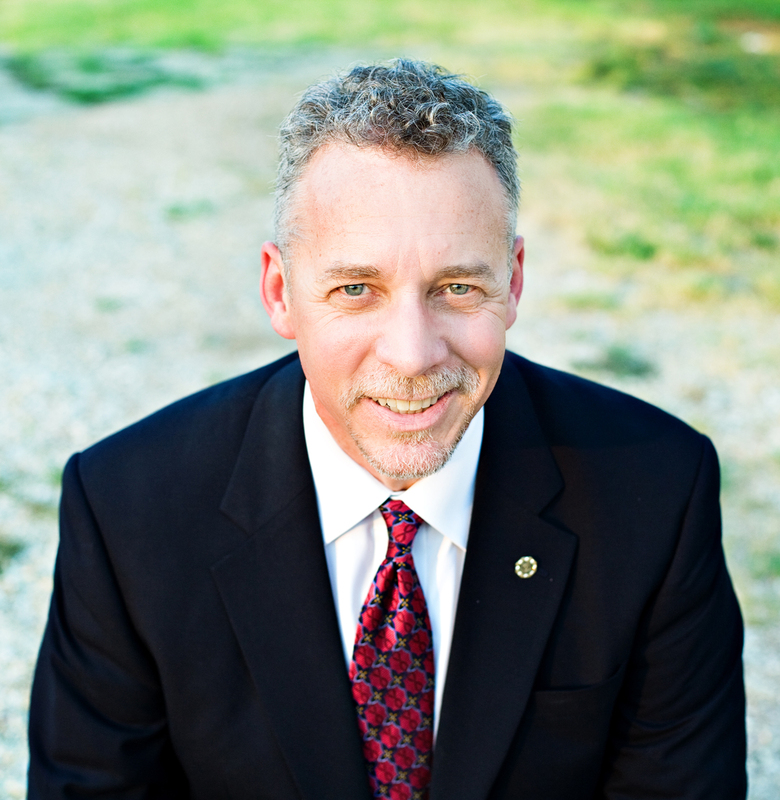 Mark Weinsoff, Vice President, West Region, served as the official President's Representative. Not to miss out on visiting the Pacific Northwest District, President-designate Danny Rodgers arranged to visit as a certified international trainer. Mark and Danny moved the group with their enthusiasm, knowledge and participation. Both participated in general training activities and made motivational speeches, but most important they each led different sessions to help make our Optimist Clubs and our personal leadership styles stronger. Mark's Sustainable Membership presentation will be a model for the coming year. Danny's presentation on Seth Godin's Linchpin will encourage us to question ourselves what are we doing all we can to empower our future leaders? In addition to Mark and Danny, our knowledge leaders included the Leadership Development team Gay Enyeart and Jean Jensen on the basics of being a club president and secretary/treasurer and Governor-designate Ed Murphy on how to be an effective lt. governor. Current leaders heard from Governor Linda Jackson about how they can contribute to the District blog, become their own publicists and increase the visibility of their club through the "Find a Club" section of the website. All members heard from Scott Keller, President, Portland NE about completing that community survey. In official business, we were fortunate to have three candidates running for governor-elect. Bill French went above and beyond in campaigning by visiting 75% of the clubs in our district and blanketing the convention with novelty items. He was rewarded by being elected as governor-elect on the first ballot. Congratulations to Bill French of the Hillsboro, OR Optimist Club. We also passed a new policy to assist in passing records forward from one administration to the next. The policy requires the district secretary/treasurer to use Quick Books and allows for the district budget to purchase the updated license and software upgrade each year. It was also recommended that the 2010-2011 budget include purchasing a laptop and LCD projector for the District. Governor-designate Ed Murphy introduced the strategic work plan for 2010-2011 that will emphasize new club building in the Seattle area, donations to the Optimist International Foundations, and a new Sub-Forty group to involve young Optimist Club members in shaping the future of the District. Mark Weinsoff congratulated the PNW District for being first in the West Region as of this meeting. Mark and Growth Director Rocky Jackson challenged everyone to stay in that position by adding enough members to reach Honor Club recognition. Honor Club is within every club's reach and it's not about awards, it's about doing all you can do to make sure your club leaves a legacy and continues long into the future. Merriwether Lewis and Albert Einstein showed up for the Old Timer's Breakfast with the theme of "Pioneers and Explorers" representing both 18th and 19th century explorations in the area. More than $200 was raised for the Optimist International Foundation to relieve Scott Keller and Albert Einstein of their neckties. Golden Apple award winning teachers Denise Rosenblum and Jackie Ives explained all about the "We the People" program that engages high school students in civics, history, and political science topics in the Tri-Cities area schools and stumped us with some of the questions asked of the students. This is a great model for an Optimist Club Respect for Law program. Charlie Kissler, Steve Enyeart and Scott Keller served as emcees for our different meal functions and Dyan Graybeal and Sue Thompson gave us some fun resolutions to live up to in the coming year. Steve Andersen was recognized for his service with the Roy Proctor Lifetime Achievement Award. Roger Thordarson and the Auburn Optimist Club were presented a certificate recognizing their 25th Anniversary by President-designate Danny. As anticipated, Abraham Lincoln appeared for the evening installation of officers as Ed "Abe" Murphy and his team were sworn into office for 2010-2011. 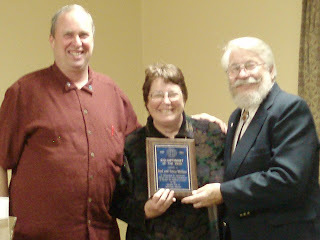 Governor Linda warmly thanked everyone for their contributions throughout the year, club presidents, district chairpersons, and lt. governors, noting that the PNW District is currently in 13th place of all Optimist Districts and only 20 members away from being even in membership from October 1, 2009. Nearly 100 Optimist Club members participated in training and fellowship at the Pacific Northwest District Optimist Convention over the weekend. We'll let you know all that happened later this week (such as Bill French from the Hillsboro Optimist Club was elected Governor-elect 2010-2011), but for now we wanted to share a slideshow with you courtesy of Alan Zehntbauer, Lt. Governor, Zone 4. 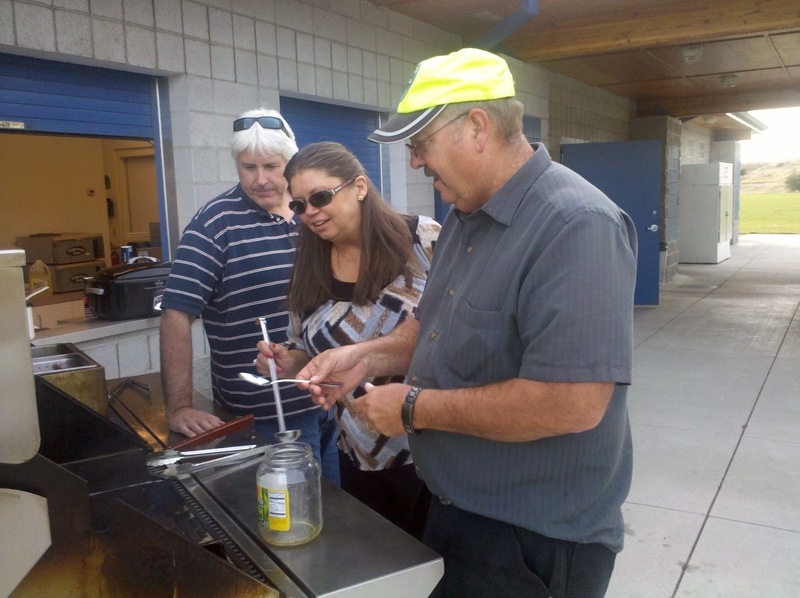 The following pictures are from the BBQ and Old Timers Breakfast. Note some of the crazy attendees including Merriwether Lewis, Marshall Dillon, and other wild west figures. Since the theme was explorers and pioneers, even Albert Einstein showed up to begin nuclear research at the Hanford Nuclear Reservation. It looks like some members rolled out of bed and came that way including rockstar Danny Rodgers and his groupies. I hope you enjoy the pictures as much as we enjoyed the weekend. It’s all in our name. As you go forth to your clubs and your communities, please share your positive, upbeat attitudes with others. Inspire your fellow club members, your friends and your families, and the children with whom you work to reach for their full potential. Enjoy being a part of your Optimist Club. Share that feeling with others because here in the PNW District, Optimist Clubs are our favorite thing! The symbol for Optimist International is an octagon; eight sides of good thoughts and deeds. When I saw that Richard St. John had identified eight words that lead to success, I knew that I had to share them with you. Enjoy!